I’m two episodes in to Laeta Kalogridis’ amazing new series on Netflix, and I’m already amazed. 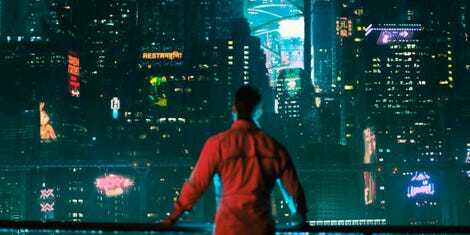 Altered Carbon is what Scifi TV should aspire to. (Yes, specifically TV.) Strap in, it’s time to talk shop. No Spoilers. In the distant future, your entire personality can be encoded onto a Stack™, a device the size of a poker chip that can be uploaded into another body (or Sleeve™) that may-or-may-not resemble your original. Presto change-o, instant resurrection. The super-rich can afford clones and live essentially forever. The lower classes can still get by on whatever bodies happen to be lying around, but murder is only considered murder if your Stack™ is destroyed. Now: not one ingredient in the above description is unique or original. But this particular recipe, the combination of elements is so dizzyingly easy to grasp that it makes my head spin. The plot is simple: a man is pulled out of cold storage and given the body of a super soldier in order to solve the murder of the richest man in the world. Said Multi-Billionaire resurrected into a clone Sleeve™ just fine, he just can’t recall the forty-eight hours leading up to his grisly demise. Every inch of Altered Carbon is a visual splendor. The eye candy is far-spread and delectable. Mile-High cities, skyscrapers that literally scrape the sky, satellite stations and all sorts of dazzling delights all add up to one clear fact: the producers spared no expense. You never forget that you’re in an impossible world far removed from our own; yet it feels distinctly possible. The main protagonist doesn’t really care about his client— at least, not so far as the first two episodes. He’s driven by self-interest, he has grudges and prejudices and is way too comfortable with spending other people’s money. I take comfort in knowing that centuries from now, people are still assholes. That much is entirely believable. I can’t begin to tell you how gratifying it is to see a cast of such diverse representation. Overpopulation is a recurring theme, frequent mention is given to off-world colonies and distant inhabited planets. It makes perfect sense that the melting pot has overflowed and spilled over. I punched the air when it really sank in how different this cast looked from most other shows being made today. In the second episode, Detective Ortega’s mother ambushes her at her home to a) feed the girl, “No one will respect a skinny police woman”, and b) try to guilt her into re-coding to the Catholic faith. The mother simply cannot understand how her daughter could reject religion in exchange for viable, applicable science. With one long-suffering “Not again”, I got a vivid understanding of what Ortega’s gone through. This is my kind of scifi. This is people arguing over ideas. This is relationships changing because of ideas. This is tension and heartache and frustration brought on by ideas. The characters are fully immured in their world, whether they like it or not. Not all Scifi needs to be R-rated. Far from it. But since it is a story being told for adults, it’s about fricking time that there was some equality in the distribution of junk on display. College Humor pointed this out to hilarious effect. It just feels more fair, somehow. Now: The important bit to stress here is that it is Television. We’re getting ten whole hours to unpack the full impact of what Altered Carbon has to show us. They’re taking their time. Informing Character. World Building. Setting Tone. Introducing and fleshing out supporting characters. Introducing backstory in a way that doesn’t feel forced or rushed. AKA things you can’t easily do in two hours. I cannot wait to see how the rest of this series unfolds, I am 100% onboard. And I really, really hope that more showmakers take note of AC’s example and rise to such lofty, ambitious heights.